It looks like some of those casting rumors were correct. On Thursday, WSJ reported that DC Entertainment president and chief creative officer Geoff Johns confirmed that Joe Manganiello (True Blood, Magic Mike) is playing Deathstroke in Ben Affleck's solo Batman film. Rumors began to make the internet rounds after Affleck teased what looked like a test screening for someone in a classic orange and blue Deathstroke costume. Soon, observant fans were putting two and two together as Joe was spotted in London where 'Justice League' is filming and he followed director Zack Snyder on Twitter soon after. Nothing goes unnoticed on social media. Joe had previously auditioned for other comic book movies like 'Man of Steel' where he tried out for the role of Superman that went to Henry Cavill. This time, he's made it into the DCEU as one of DC's most formidable combatants. 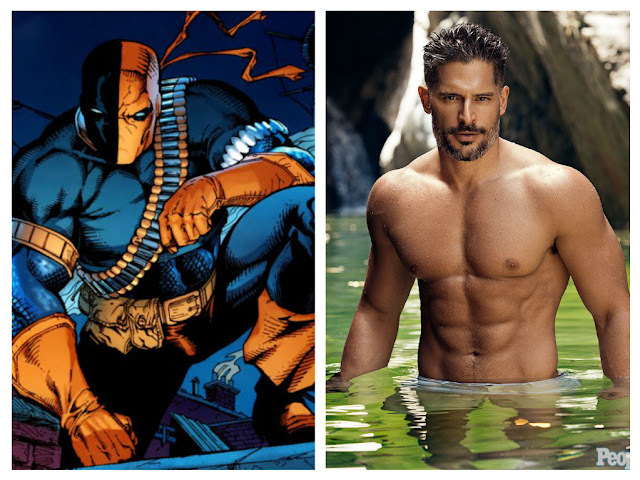 Deathstroke/Slade Wilson possesses various enhanced abilities granted by an experimental serum including superior strength, heightened speed, stamina, endurance, and reflexes. He's multilingual, a tactical genius, capable of using more of his brain than a normal person and through his military training is one of the best fighters in the nation using various martial arts and weapons. He also has an accelerated healing factor that allows him to recover from wounds much quicker. Slade is virtually superhuman despite the loss of one of his eyes. It's conceivable that Deathstroke makes a cameo in 'Justice League' since it's still over a year away and currently filming. Affleck and Johns are writing the Batman film but no release date has been announced. It probably won't see theaters until after 2018. Batman Ben Affleck casting comic books DC Comics Deathstroke Joe Manganiello movie Warner Bros.
Labels: Batman Ben Affleck casting comic books DC Comics Deathstroke Joe Manganiello movie Warner Bros.